Dress, scarf and boot tops. Wig, makeup, bracelets, shoes and sword are not included. Includes a dress, scarf and boot tops. 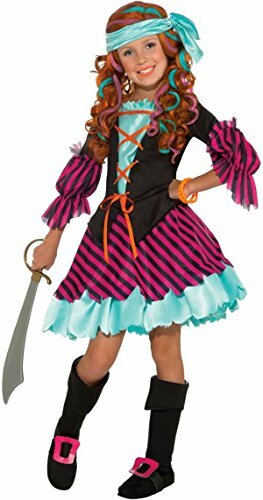 Salty Taffy Kids Costume includes a colorful dress with pink and black stripes on the skirt and sleeves, teal detailing on the bottom of the skirt, lace-up detail on the front, teal head scarf and black boot covers with a pink belt detailing. This amazing Pirate Costume for girls is available in child sizes Small (4-6), Medium (8-10) and Large (12-14). Please note: Wig, makeup, bracelets, shoes and sword are not included. Please be advised that the fabric that looks blue on the picture is actually teal/turquoise.